I walked the 9th link of the Hertfordshire Chain Walk on the 26th February 2006, immeadiatly after I had walked the preceeding two links. 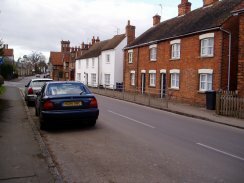 The route of the path crosses Watton at Stone Higth Street where I had parked near the George and Dragon pub and heads down Mill Lane. 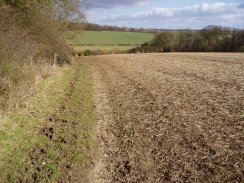 The path crosses the River Beane and then almost immeadiatly, at a fork in the path, follows a footpath signposted Blue Hill. This path crosses a field to the A602, which was quite busy and took some time for me cross. The path then heads up the track between fields in a wide shallow valley which curves just enough to keep the walk interesting and the views ahead slightly obscured, photos 1 and 2. 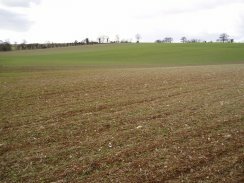 The landscape here was very much one of wide open spaces, with gently rolling hills and large fields, photos 3 and 4. What can't be seen in the photo's was the very strong wind that blowing, directly in my face at this point in the walk. Continuing along the track, which eventually becomes a footpath beside a field edge, I strayed slighly off course as I followed the field edge round almost all the way Loefield Grove, rather than turning and crossing the field to High Elms Lane which meant I had to retrace my steps slightly. This part of the walk is exactly on the join between the OS landranger maps 193 and 194 and I had not been paying proper attention to where I was going! 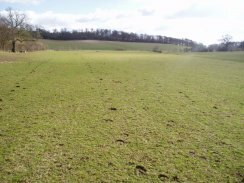 There is also almost no evidence of the footpath on the ground as it crosses the field that leads to High Elms Lane. 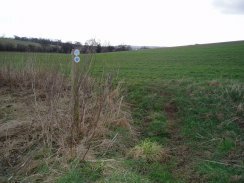 The route is much clearer however if you are coming in the other direction with a signpost besides the road, and another marker at a field boundary which points in the right direction across the trackless field, photo 5. 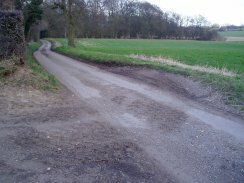 The path crosses High Elms Lane and then heads along a track towards Burns Green and Hebbing End. 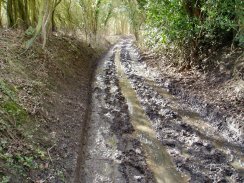 This was rather muddy as it had been used by a number of vehicles and it some points has running water flowing through it, photo 6. 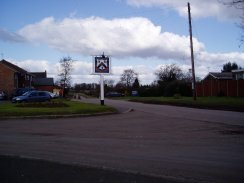 When I reached Burns Green I sat down on a bench opposite the Lordships Arms and had a sandwich to eat. While eating a huge flock of rooks or crows passed overhead cawing away. Althought they can't been seen in the small version of photo 7, in the full size version of photo I counted 98 birds. The chain walk then heads down Hebing End, passing some houses before reaching a footpath that runs downhill beside a field, photo 8. The bottom of the valley marks the join between the 9th and 10th links of the chain walk, photo 9. 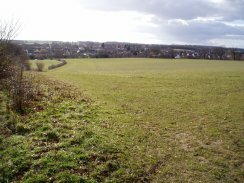 While the path also continues ahead and uphill I turned right through a newly built gate and along the bottom of the valley, photo 10, to commence my walk back to Watton at Stone. After a crossing two fields the path leaves the link between the 9th and 10th links and turns right along a track that runs uphill to the Whemstead Road, photo 11. 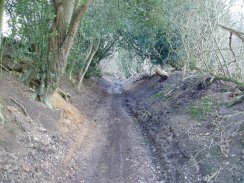 This track had recently been improved and had been closed to four wheel traffic although I was passed by a number of motorcycles on this path and on the track the otherside of Whemstead Road. 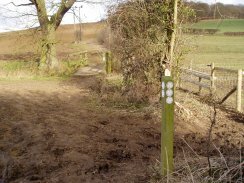 The path leaves the track and crosses over a stile and into fields which are followed to Gregory's farm. Just past Gregory's farm I met an elderly man walking his dog and we got chatting. He had been born on a farm nearby and spent most of his life in the area and mentioned how it had changed so much. He also metioned how few people he saw out walking in the countryside. 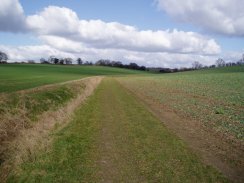 Eventually we went our separate ways and i headed down to Mill Lane, photo 12, and the final walk back to Watton at Stone. 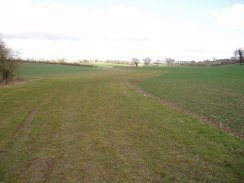 The path makes it way downhill along Mill Lane with views towards Watton at Stone, photo 13. The road was not too busy and I was only passed by a few cars on my way to re-cross the A602. At the road junction there was a rather sad roadside memorial to someone who had died there which made me feel a bit down. On the other side of the A602 the road had been closed to traffic sometime ago and was gradualy being reclaimed by grass and other plants as it lead down to the bridge over the river Beane that had been crossed earlier for the short walk back to Watton at Stone High Street, photo 14. 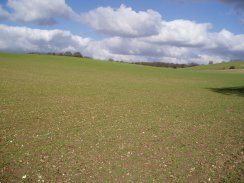 This had been my first proper walk for some time with a full pack and my leather boots and despite the windy weather had generally been a very enjoyable. Because of the blisters I had got when out walking earlier in the year I was trying out a new pair socks which proved very comfortable and my feet, and legs for that matter, felt fine at the end of the walk. The GPS made this walk 7.52 miles long.